The film Housefull 4 hit many controversies after its director Sajid Nadiadwala and actor Nana Patekar were accused of sexual misconduct. Both stepped down from their respective jobs. Farhad Samji was brought in as the director and Nana Patekar too walked out of the film. Now that everything is under control the makers have wrapped the shoot of the flick, which will be released in theatres in 2019. 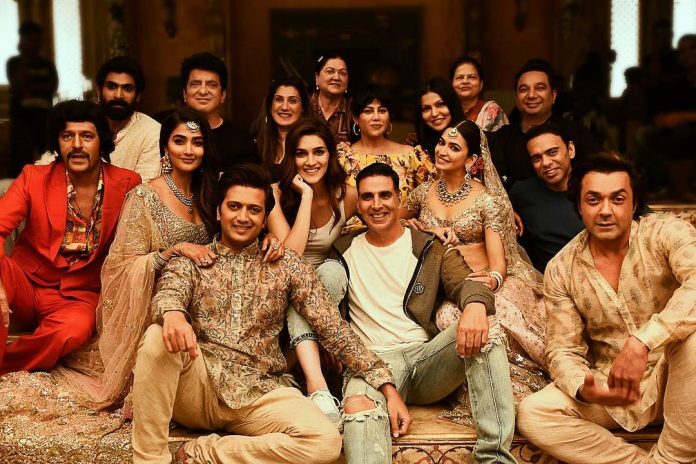 Housefull 4 is based on the issue of reincarnation and is one of the most anticipated films of the year. The film has two tracks, one portion traces the actors and their lives in the present day while another segment will take the audience back in times almost 500 years back. Akshay Kumar will be seen as a maharaja in one of the segments that deals with the past life while Bobby Deol and Riteish Deshmukh will be seen playing his royal courtiers. Reports say that the female actors Kriti Kharbanda, Kriti Sanon and Pooja Hegde will step in to the shoes of princesses. A few months back a picture of Akshay Kumar had gone viral on the internet that showed him in a bald look. Reports suggest that the first half of the film will show Akshay sport different looks as the king. The film is expected to be released in theatres on October 25, 2019. Next articleStudent Of The Year 2 official trailer out now!